Every day, 13 workers die on the job in the United States. Employers continue to lose billions of dollars on other serious, nonfatal injuries. With so much at stake, managing the risks posed by hazards in the workplace has never been more important. 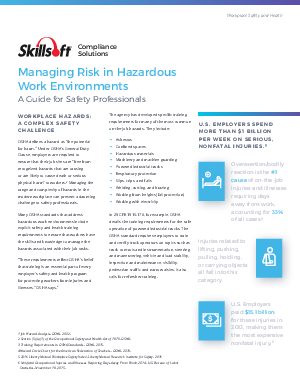 This new white paper from Skillsoft Compliance Solutions describes the problem and how safety professionals can work towards solving it. This asset is made available for free courtesy of Skillsoft Compliance Solutions, a pioneer in the field of learning and talent management with a long history of innovation.